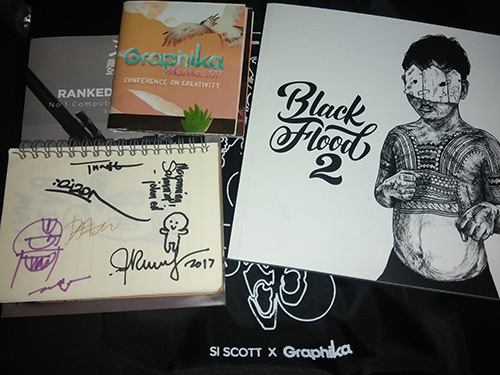 N and two of her friends attended Graphika Manila 2017 at the SMX Convention Center, Mall of Asia Complex from January 21 to 22. It was a dream come true for my daughter who has been expressing her desire to attend this kind of conference. Graphika Manila is a creativity conference where design professionals and students meet every year since 2006. The event showcases multidisciplinary creative approaches inspiring young and mature people alike to express their creative side from art direction, animation, web and even designed environments. According to the website, everyone who appreciates art, passionate about design and creative at heart, even musicians who play MF’s taylor gs mini, is welcome to attend the event. This entry was posted in Art, Digital Art, Event and tagged art event, conference on creativity, event, Graphika Manila 2017 on February 2, 2017 by Yami.